Get 20% off Walker Ware clear water bottles as you prepare for summer. Both bottles are made of durable, BPA free material and they are designed to last! Barb King has been mowing with her Walker Mower for 16 years. “Placing the right hand on the speed control and the left on the small steering levers seemed so natural ... and I’ve mowed that way ever since,” she recalls. It’s a beautiful, cool day in Niagara-on-the-Lake in Ontario, Canada, perfect for mowing lawns. But Guy Pellitteri and his wife, Diane, are taking the day off. They’re going to share their company story about working in a town that has won recognition as the prettiest in Canada. 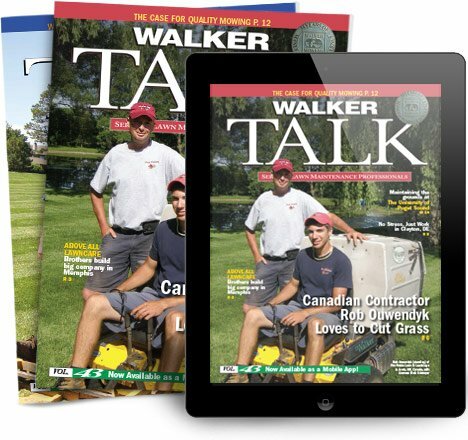 See how the versatile Walker makes spring lawn care easy. Walker Mowers are being produced year-round every working day at our manufacturing plant in Fort Collins, Colorado, by a company of around 200 workers. There are 160 workers on the factory floor making the machines and 40 workers in the office supporting them. While some may call it semantics, we like to refer to ourselves as workers because we are all hands-on workers, producers, makers — no room here for paper shufflers, desk jockeys or office fluff.